Have you ever imagined what India will look like 20 years down the line? From the start of this Millennia, India is growing in stature and every country in the world is noticing it. Do you know the reason why India is becoming a force to reckon with ? Just for a comparison sake, I look at India as a startup – A startup whose time has come to make it big. Right now people are noticing the smaller achievements here and there. It is slowly coming on everyone’s radar and they are slowly understanding its potential – They understand the role India is going play in tomorrow’s world. The key to India’s growth will be its growing Middle class population – primarily the population that is moving from Rural India to Urban India. 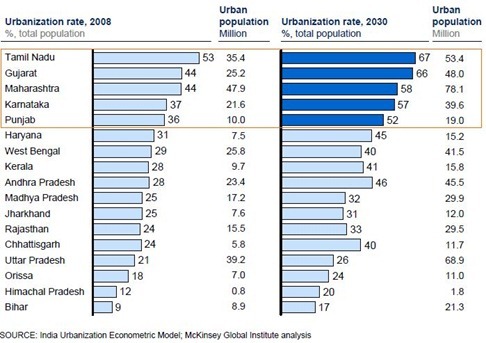 McKinsey Global Institute has some out with a report called “India’s Urban Awakening” which gives you some numbers on where India can potentially be 20 years down the line on back of rapid pace of urbanization that India is witnessing. India’s population will reach 1.47 billion with around 40% urbanization – That means close to 590 million will be living in cities. 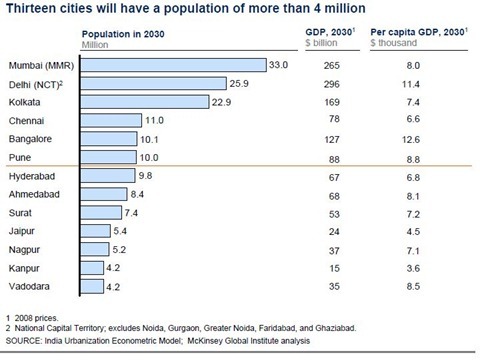 India’s scale of urbanization will be immense – India will have 68 cities with population more than 1 million, 13 cities with more than 4 million people and 6 megacities having population more than 10 million residents ! The per capita income will see a four-fold increase over next twenty years – From an average per capita income of 35000 rupees to 1,36,000 rupees by 2030. There are many other interesting numbers in the report prepared by MGI, you can download the report from here. Now, these are achievable – infact, India can even have accelerated growth, but the key to all this growth is also the investment that need to go into facilitating this growth – The report says that India will need a whooping 1.2 trillion USD investment in next 20 years, especially in infrastructure. Close to 2.5 billion sq. mtrs of road and 7,400 kms of metros and subways will have to be build over the course of next 20 years. We are lucky to be in India right now and witnessing this frantic pace of growth ! China – Saving Grace for World Economy! today is 2015 July and we’ve already become world’s 7th biggest economy and fastest growing large economy. Our literacy rate has suddenly started jumping, our internet users have reach over 300 million (that will be 580 million by 2018) and in 2020 600 million as of plan of government. We are “betting” to surpass Britain in this decade. 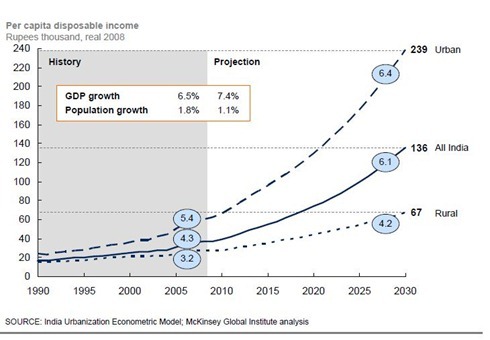 But world bank says that we can surpass Japan in 2019 and reach near to US and China in 2030. Movies offensive on religions have not been banned because people are vastly forgetting superstitions. Out of 100 smart cities, 4 ready to live are under “rehabilitation”. 200 million houses are being built. 20 million toilets are being built. Indian skilled %age jumped from 2% to 3.5% in last month and gonna reach 40%+ in 2020. Indian military is working on 5th generation, electromagnetic, laser and orbital weapons. ISRo has already sent a Mars mission in 2014 and aiming for landing rovers on Moon, Mars, space station, a sun orbiting satellites,own Navigation system, With Fi satellites and telescopes like Hubble. Just 20 Years from now on? Hard to believe. 20 Years of Liberalization haven’t changed things much for the masses living in villages/those migrating to cities in search of livelihood. Planning ahead is something which the policy makers have to keep in mind. There should be proactive planning rather than reactive planning(eg:how many traffic flyovers really ease traffic). By advanced world benchmarks India has a lot of ground to cover. A small personal experience: Once in 2010 I saw a neat line of pavement slabs in a quiet neighborhood in USA. I thought these slabs might be newly placed. When I took a look at the dates engraved there I was shocked – 1960! 50 Years. I wondered back in India is there anything like this. Since 1990, a series of International conferences (ICPD and MDGs) on global development held between nations recognized that empowering women and improving the efficiency of their work is critical for reducing poverty. Yet, one of the most important reasons why India lags behind many of its competitors is the deep rooted bias against half of its population i.e girls and women, the poorest among whom are denied basic health and education. Social development is the only key that will will prevent the huge 440 million of indians below 25 yrs from wasting their productive years in ignorance and poverty. Imagine what can be possible if they are strengthened through health and education. The Human Development Index places India way below countries like China, Brazil, UAE among others because of abysmally low percentage of women in professional workforce.Imagine what can be possible if child marriages among the 70% rural populaiton is curbed ; it would protect girls as young as 14 from early pregnanices giving rise to all kinds of complications. It would make them study and give birth to healthier generations. So if India has to be an urban dream, then social development has to be the top priority. It is always nice to hear that “we are growing rapidly”. This phrase gives you a sense that the worst time is now past us and the good times will follow. You may consider me a skeptic but I am not so sure that India can grow its social capital as well as its economic capital. Take housing as an example. Have you imagined how many homes need to be built to house such a population? Pose your answer against the caliber of the real estate agents/ builders/ state agencies that can handle so many transactions. Do you feel the marketplace can bear the load of many transactions? Will the state agencies manage to accurately record the transactions? Will home buyers get good quality advice & service from agents/ builders, etc.? I wish and pray for India and Indians that this growth happens in the correct social context. I have intense interest in macro economic trends and have analysed Indias projected growth.So i will strongly disagree with this report. When Indias per capita income is now 3000$ (PPP) which would translate to around Rs 138,000 in purchasing power parity terms according to the IMF report. Infact even the nominal GDP per capita income is around 1014$ which would translate to Rs 46,000 in nominal terms. 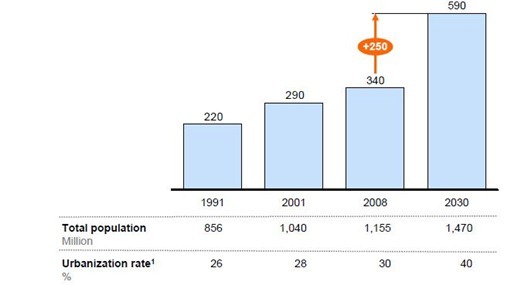 Lets assume that it will increase four fold by 2030 with the Indian fertility rate having already reached “Replacement rate” (hopefully the popluation does not increase further) We are easily looking at a Per capita income in Purchasing power parity terms at around 13,000 $ per annum which would translate to around Rs 600,000 in PPP terms and Rs 136,000 as given in this report in nominal terms. The reason why Im giving emphasis on the PPP basis is for the comparison with other economies and it will show a more realistic picture on our growth. Im more bullish on the Indian growth story than this report.I believe that we will reduce poverty to around 20% of the population by then. I agree that Infrastructure might be the only hindrance,time for govt to invest in Infrastructure in semi urban areas leading to more employment of rural India rather than the huge money spent on NREGA and schools (a huge portion of our budget) where the drop out rate is high as 80%.The Govt should accept when a scheme goes awry and immediately invest in more productive activities.It is sad that Economists of the acumen of Prime Minister Mr Manmohan Singh,Mr Motek Singh,Mr P chidambaram have failed to achieve success in any of these schemes.